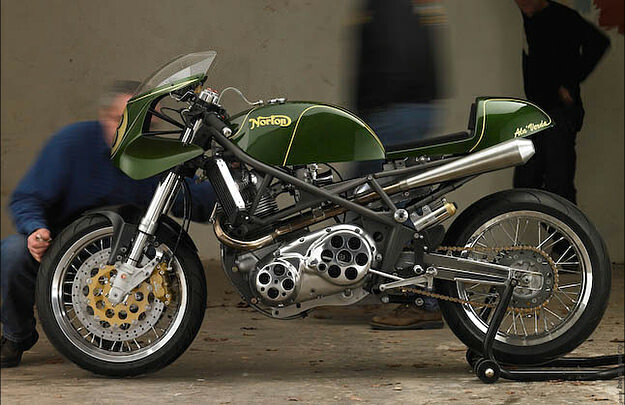 This delicately beautiful cafe racer uses a Laverda trellis frame and a late-production, modified Commando 850 engine. It was built by French violin-maker Daniel Delfour, one of a group of enthusiasts that runs a classic racing festival. The festival is at Circuit Paul Armagnac in the south of France, but Delfour’s bike is now in the USA: it will go under the hammer at the 2009 Daytona Classic Motorcycle Auction in Florida on March 7. The excellent image, by the way, was taken by Benoit Guerry.